On January 29, 1779, British forces captured Augusta, Georgia. 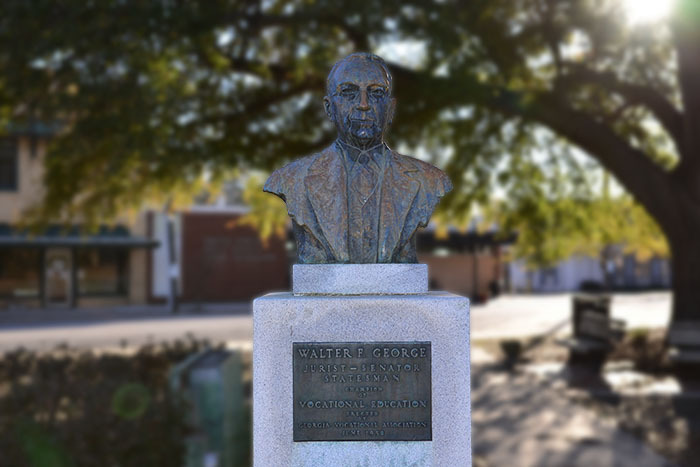 Walter F. George was born on January 29, 1878 in Preston, the county seat for Webster County, Georgia. Ron Daniels has a brief bio of the United States Senator who gave his name to a Law School, a courthouse, and a lake. 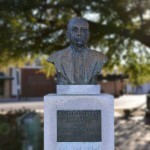 The photo above is a bust in the town square of Vienna, Georgia, in Dooly County, where George made his home. On January 29, 1892, the Coca Cola Company was incorporated in Georgia in Fulton County Superior Court. On January 29, 1955, Georgia Governor Marvin Griffin signed legislation granting the power to take land needed for the Stone Mountain Park through condemnation if negotiations to buy it fell through. On January 29, 1977, Congressman Andrew Young resigned his seat to accept the nomination by President Carter as United States Ambassador to the United Nations. On January 29, 1998, a bomb exploded in a Birmingham, Alabama abortion clinic, killing a police officer. Eric Rudolph would later admit to setting that bomb, along with the Centennial Park bombing in 1996, and the bombing of a Sandy Springs abortion clinic and an Atlanta bar in 1997. 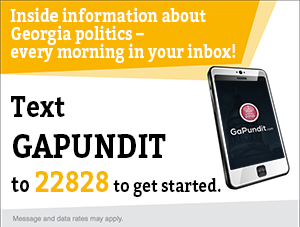 All Georgia Senate Committee meetings are canceled today. Today at Georgia Emergency Management and Homeland Security Agency Headquarters, Governor Kemp announced the closure of state offices for Tuesday, January 29, 2019 in 35 counties across North Georgia and metro-Atlanta for potential winter weather. The weather could not have come for a worse time as the metro area expects nearly a million visitors as Atlanta hosts Super Bowl LIII on Sunday. Atlanta Mayor Keisha Lance Bottoms echoed Kemp’s mandate and asked all the non-essential employees to stay home. Kemp said concerns that the snow could melt, leading to icy road conditions, figured into his decision. Delta Airlines canceled 170 flights at Hartsfield-Jackson airport in advance of anticipated snow, according to the Atlanta Business Chronicle. A new inland port planned for Hall County will be exempt from local zoning, according to the Gainesville Times. “The Georgia Port Authority is a state entity, and any state government facilities or state entities are not subject to local zoning ordinances,” Srikanth Yamala, the county’s planning director, said. The port, which could open in 2021, will be at the Gateway Industrial Centre off of Ga. 365 and is expected to handle about 150,000 containers a year. Construction is set to begin in August. Attorneys for Secretary of State Brad Raffensperger sought dismissal of an election lawsuit, according to the Savannah Morning News. In House District 28, a lawsuit over the summer’s Republican Primary began in Banks County Superior Court, according to AccessWDUN. An election challenge by former Georgia House District 28 Rep. Dan Gasaway got underway in Banks County Superior Court on Monday and will continue later this week. On Monday, Gasaway’s case against the boards of elections and registration in Banks, Habersham and Stephens counties and against current House District 28 Rep. Chris Erwin began before Senior Judge David Sweat. [Gasaway attorney Jake] Evans said election irregularities are a bigger issue than just those who are party to the case. Evans argued the court must throw out the Dec. 4 House District 28 re-do results where Erwin unseated Gasaway for the second time and order yet another House District 28 election. Property taxes have become an issue in the Special Runoff Election for House District 5, according to the Chattanooga Times Free Press. Georgia State House candidate Matt Barton defended his record as a city councilman Monday, arguing his political opponent is not providing the full picture about his history with property taxes. Jesse Vaughn prodded at one of Barton’s campaign mailers in a video statement last week, questioning Barton’s claim that he “slashed” taxes during his time on the Calhoun City Council. From 2010-17, when Barton served on the council, the city’s tax rate increased by 24 percent. Barton argues the situation is more complicated than Vaughn insists. Yes, the overall property tax rate increased during his years in office. But some of those years, the overall property values in the city decreased. Raising the rate is only one half of the equation. With the lower property values, the city’s actual tax revenue decreased in five of his eight years in office. Albany-Dougherty County voters will decide on a Special Purpose Local Option Sales Tax for Transportation (T-SPLOST) on March 19, 2019, according to the Albany Herald. The Albany-Dougherty T-SPLOST referendum cleared its final hurdle after getting approval late last week from the Dougherty County Board of Elections. The referendum will be the single item on a special election ballot set for March 19. The County Commission approved an intergovernmental agreement on the transportation special-purpose local-option sales tax during a called meeting Jan. 18. The city followed with its approval on Tuesday of last week. Officials project the T-SPLOST, if approved by voters, will generate $80 million over its five-year span. Based on the agreed-upon 67-33 split, the city would receive $53.6 million in allocations, while the county would get $26.4 million. The State House Committee on Economic Development and Tourism heard two bills aiming to extend broadband internet access to rural areas, according to GPBNews. [The] State House Committee on Economic Development and Tourism held a hearing Monday on two bills that would authorize telephone companies and Electric Membership Cooperatives to provide broadband. One of the bill’s sponsors, State Rep. Penny Houston (R-Nashville), told the committee both pieces of legislation address consumer concerns about having the utility companies offer the service, including prohibiting the intermingling of broadband bills with a customer’s electric, gas or phone bills. If Georgia enacts the legislation, the state will have the ability to apply for some of the $600 million in federal loans and grants for broadband infrastructure in rural areas through the Farm Bill. Marqus Cole of Snellville announced he will run as a Democrat to challenge Congressman Rob Woodall in 2020, according to the Gwinnett Daily Report. State Senator Nikema Williams was elected Chair of the Democratic Party of Georgia, according to the AJC. The first black woman elected to lead the state party, Williams takes over an institution energized by the campaign of Stacey Abrams, who narrowly lost the governor’s race to Republican Brian Kemp and continues to be seen as a rising star nationally. In picking Williams, Democrats elected a protege of Abrams who has a similar approach: An intense focus on targeting voters often ignored by politicians, an embrace of liberal policies and a knack for taking the fight to the GOP. She’s taking the helm at a critical time. Democrats lost every statewide election, but scored victories across the suburbs and made the race for governor the closest in decades. Williams, a state senator representing a liberal Atlanta-based district, said she plans to be an assertive voice for Georgia Democrats, refusing to shy away from confrontations with the majority party. She got a head start on that in November when she was arrested during a protest at the state Capitol over the gubernatorial election. The Oscar Meyer Weinermobile visited Savannah, according to the Savannah Morning News. The drivers of the Oscar Mayer Wienermobile said they had a “bunderful” time in Savannah this weekend. “Habanero” Hayley Rozman and “Ketchup” Kyle Edwards have been driving the 27-foot hot dog for the last eight months. They’re two of 12 “hotdoggers” that are hired each year by Oscar Mayer to drive the iconic Wienermobile around the country. Oscar Mayer will be accepting hotdogger applications until Jan. 31. The applicants will be whittled down to 12 new Wienermobile drivers, who will begin their duties on June 1. No special license is required, though Rozman said she often tells people she has her hot dog license. Anyone with a bachelor’s degree is encouraged to apply, but Edwards said to be prepared for the job requirements. Duluth Mayor Nancy Harris delivered the “State of the City” address, according to the Gwinnett Daily Post. Residents were handed “thumbs up/thumbs down” paddles as they arrived at the event. The annual address had a “Rumor Has It” theme and the paddles were for a section of the event that highlighted that theme. Harris read a rumor — some of which she came up with specifically for the activity — and residents had to hold up their paddle and indicate whether they thought it was true or false. The address’ overarching “Rumor Has It” theme was a way for Harris, who has taken to using a talk show-style format for her state of the city addresses in recent years, to deliver news about what will be coming up in the city in 2019. The City of Lula is adapting a well to provide water for the municipal system, according to the Gainesville Daily Times. The well is located next to the Ace Hardware on Cornelia Highway, near the turn on to Athens Street to get to downtown Lula. City Manager Dennis Bergin said discussions with Ace Hardware began in September. The hardware store needed to increase the capacity of the well, and the city wants to bring water service to the area to prepare for business and residential growth. While the city has not officially acquired the well yet, Bergin said about $30,000 has been spent on tests for the well, which determined that iron and manganese levels were slightly too high. The well will need to be adapted for the city’s needs. It currently has a PVC casing, which will need to be replaced with steel, and at a meeting Thursday, officials said they wanted to install 180 feet of casing in the well to compensate for a fracture and lower treatment costs. Lula plans to apply for funding through the Georgia Environmental Finance Authority, Bergin said. Rome City Commission continues to debate revisions to the smoking ordinance, according to the Rome News-Tribune. The measure would create a smoke-free downtown — banning smoking and vaping on Broad Street and other public areas. Concerns range from enforcement to a loss of business, but supporters want to use it to change the atmosphere in the district. “This is not trying to get into the business of business owners; it’s a public health issue,” said Commissioner Craig McDaniel, whose public safety committee narrowed the scope of the ordinance recommended by a coalition of local healthcare advocates. Cities such as Canton, Marietta, Norcross, Duluth and Savannah have instituted bans and the initiative appears to be growing. “These communities and cities that are smoke-free are doing just fine, and we’re not going to make everybody happy no matter what we do,”∏ said Commissioner Jamie Doss. The renovation of the Glynn County Tax Commissioner’s office is 70 percent complete, according to The Brunswick News. A delegation from Columbus is attending the Sundance Film Festival in Park City, Utah, hoping to attract more filmmaking to their city, according to the Ledger-Enquirer. A small delegation from Columbus, with a $5 million incentive fund in place for luring prospects, headed to Park City, Utah, home of the famed Sundance Film Festival that runs through Feb. 3. With more than 40,000 people typically attending the nearly two-week event, Sundance, founded by actor Robert Redford in 1978, is the largest independent film festival in the United States. Those expected to pitch the city and its growing filmmaking amenities during a two-hour “Choose Georgia” reception on Sunday were Chris Markwood, Columbus State University’s president; Richard Baxter, CSU’s associate vice president of Engagement & Economic Development for University Advancement; Pace Halter, president and chief executive officer of W.C. Bradley’s real estate division; and Peter Bowden, president and chief executive officer of the city’s convention and visitor’s bureau and the Columbus Film Commission. Savannah is seeking an operator for a cafe at Forsyth Park, according to the Savannah Morning News. On Thursday, the city issued another request for proposals after a previous attempt last year failed to generate a recommended lease agreement for the Savannah City Council to approve. Real Estate Services Director David Keating said it is the city’s hope to find a well-experienced restaurateur capable of establishing a successful venture that will be good for the community, but they have no preconceived notions of what that operation will be. The Downtown Dalton Development Authority will track local inventory as a way of tracking investment and job creation, according to the Dalton Daily Citizen. A Lake, a School, and a Courthouse.